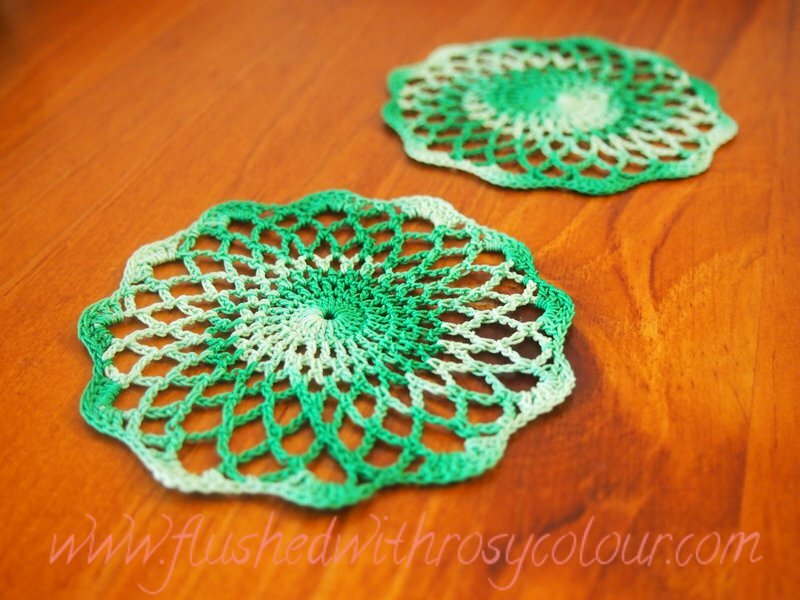 I made these two small doilies for my sister-in-law Lynelle, who asked me to make some to match the large green doily I gave to her last year. These ones are intended to sit on a dresser as doilies for small objects, but they are the same size as drink coasters. You can use them as coasters but I wouldn't recommend that because they will need to be washed more often. I was going to make up my own pattern, but decided to follow one I saw on pinterest. This easy doily pattern was easy to make up, the pattern is by Maggie Weldon and is available for free on bestfreecrochet.com. Although I do prefer working with less fine cotton and larger hooks, tiny work like this really hurts my eyes. For these doilies, I used fine cotton and a 1.5mm hook. To help me memorise the pattern I simplified it, its basically a round of 24, then a round of 24 (dc 1 ch), then a round of 3 chs, a round of 4 chs, then 3 rounds of 6 chs, the last is 7 dc into every 2nd ch sp, (1 ch sc 1 ch) into the other ch sps. The doilies needed blocking because they were slightly different sizes, after blocking they came out fine. To wash these doilies you need to wash in cool water and squeeze gently. Then lay flat onto white foam or thick white cardboard and pin out, starting with a pin in the centre. 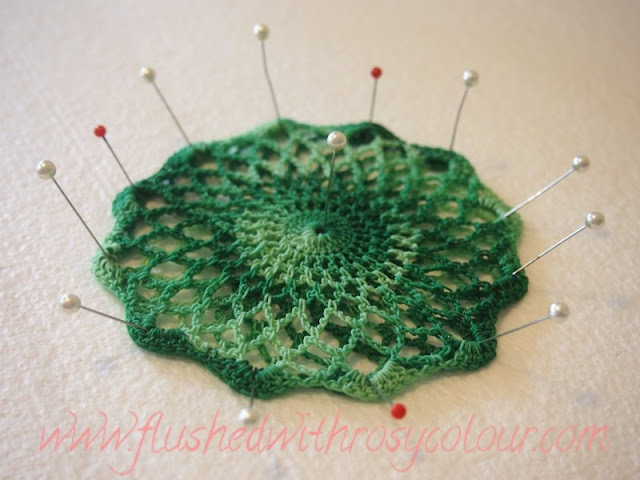 This will make the doilies sit nicely, don't remove them from the pins until the doilies are dry. I'm going to post these to Lynelle for her birthday, I hope she likes them! 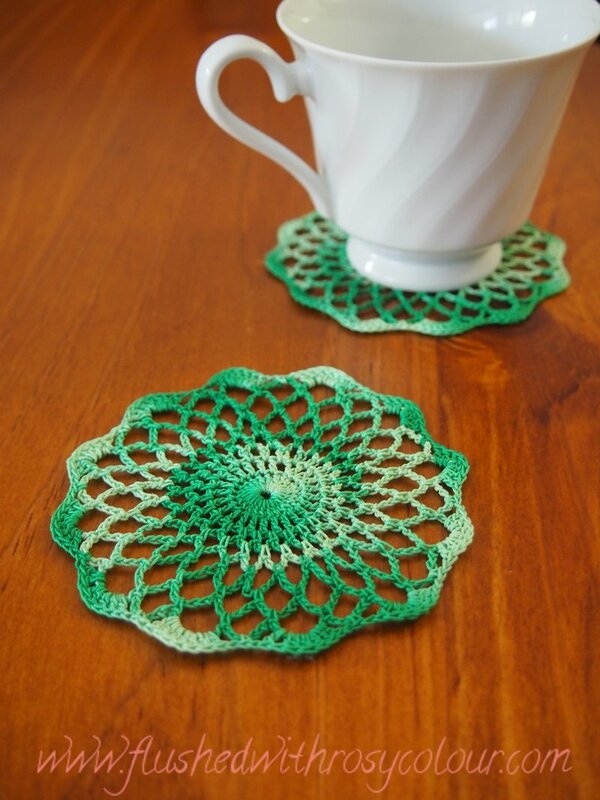 I love the lattice work in the doily-- I'm sure that your friend was delighted to receive them!